The national Armenian flag is called Yerakouyn. It consists of three horizontal equal stripes of red, blue and orange colors (the last one is often called as color of apricot). The current Armenian flag was adopted on August 24, 1990 and it replaced the flag of the Soviet Armenia. 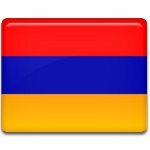 Flag of Armenia, as of any nation, is symbolical. Every color represents nation's point of view and historical events, that influenced on development of the country. There are many interpretations of flag colors, one of them says, that red stands for blood shed by 1.5 million Armenians in the Armenian Genocide, blue is for pure sky and orange is for country's courage. Official version of color definition is stated in the Constitution of the Republic of Armenia. It says, that red represents the Armenian Highland and people's struggle for survival, blue symbolizes will of Armenian people to live under peaceful sky and orange stands for creative talent and hard-working nature of Armenians.